I was happy this week to see an albino squirrel in our backyard. Long time readers of my blog will know our history with albino squirrels. We see them as kind of like our guardian angels. I had never seen one in my life before my boys were born. Now we've had some come in our yard every summer for the past 18 years. That's across two different houses. They're pretty awesome. Blue is also pretty fond of the squirrels outside our house but probably for different reasons. This little guy is pretty brave. I'm not sure he really wants to be associated with being in the same bowl where Blue normally eats his food. On Thursday night, we had our Prior Lake Empty Nester Club get together at Charlie's on Prior. We aren't getting as many people to show up as we did a few months back, but we did see a few new faces this time which made it a bunch of fun! On Friday night, Miss Sheri and I went to downtown Minneapolis to Target Field. I guess it takes really big balls to be down here. Miss Sheri's cousin Deb and her husband Al were going to the game so we thought we'd crash their party. It was a great way of getting a chance to spend some time with them. It was Prince night which is something that seems to be happening all over the place in Minnesota these days. Prince Night means that they gave away inflatable Prince guitars, hats, and played Prince Music between innings. It's kind of bizarre seeing Prince exploited in so many ways since his death. When he was still alive, he was notorious for not allowing anyone use his music in any ways that he didn't completely control. I even received my first copyright strike from YouTube for posting a video of me singing a Karaoke version of "Let's Go Crazy". That is no longer the case, though, and you now can see Prince music and memorabilia EVERYWHERE. I guess the people who now control his estate have a much different opinion on commercialization than he did. There was also a baseball game taking place. The Los Angeles Angels were in town to take on the hometown Twins. We aren't huge baseball fans, but we do like taking in a game or two every year. Especially now that we have Target Field, it's a lot more enjoyable way to spend a summer's eve. I took the picture on the left on my iPhone with the intention of sending it to my family. 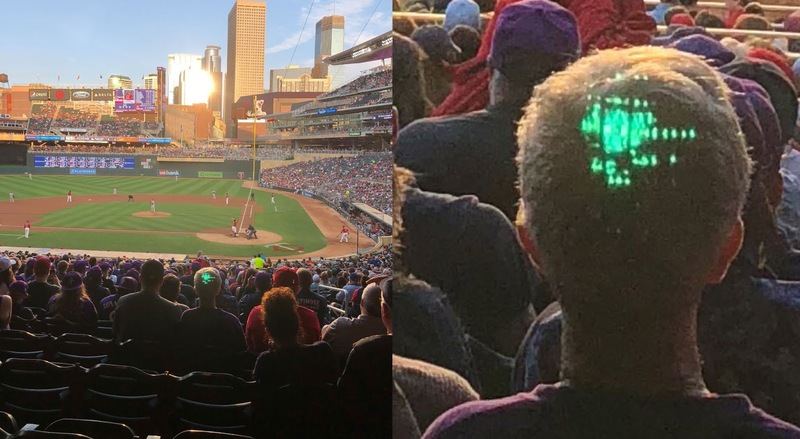 After sending it, we noticed the weird artifact on the guy's head in front of us. I blew it up on the right. This guy's head did not look like this in person. My hypothesis is the glare from the sun bouncing off the big buildings in the background was very intense. I’m guessing the reflection caused some strange reaction to the camera on my iPhone. Either that or that dude is a freaking robot! The game was pretty close. We saw a couple of home-runs, but unfortunately the visitors were too much for the home team. The Twins lost the game 4-2. The game wasn't the only thing the pitcher appeared to have lost. He was looking for something else the entire time he was out there. I hope he eventually found it. The game ended and then we were treated to an incredible display of fireworks with Prince Music blaring in the background. What a neat way to spend a Friday night in June!